This week's 30x30 experience might fall into the "slightly morbid" category, but I once took great joy in joining thousands of other tourists and running around Paris' Père-Lahaise cemetery to find the final resting places of Jim Morrison, Edith Piaf, Oscar Wilde, and dozens of other famous denizens. So it didn't strike me as too bizarre when I decided to take an afternoon (and a long subway ride) and pay homage to some of New York's more famous residents spending eternity in the state's largest cemetery. I probably use this phrase too often, but boy am I glad I visited that cemetery. Not only was it interesting to visit the grave sites of Leonard Bernstein, Horace Greeley (of Greeley Square! ), and Jean-Michael Basquiat, but I happened to go on what was possibly the most picture-perfect fall day of the year. Maybe ever. (ed. note: I bear no shame for hyperbole) The sun was streaming, the trees were lined with gold, there was a chill in the air and a crunch under my feet, and I swear the leaves were actually slowly falling around me, ensconcing me in my own personal, over-saturated Thomas Kinkaid painting. There was also not a soul around for what seemed to be miles. It was like everything Central Park wants to be but is too popular (and populated) to actually achieve. There actually isn't too much else to say about this except that if you're looking for a quiet place in a busy city to walk and think, then I highly suggest Green-wood Cemetery. It's obviously free, and depending on where you live, possibly even more accessible than some of the city's larger parks. As long as you are respectful to the deceased and anyone living who may be visiting said deceased, then there is no reason why someone can't use a cemetery as a serene, reflective, meditation spot. 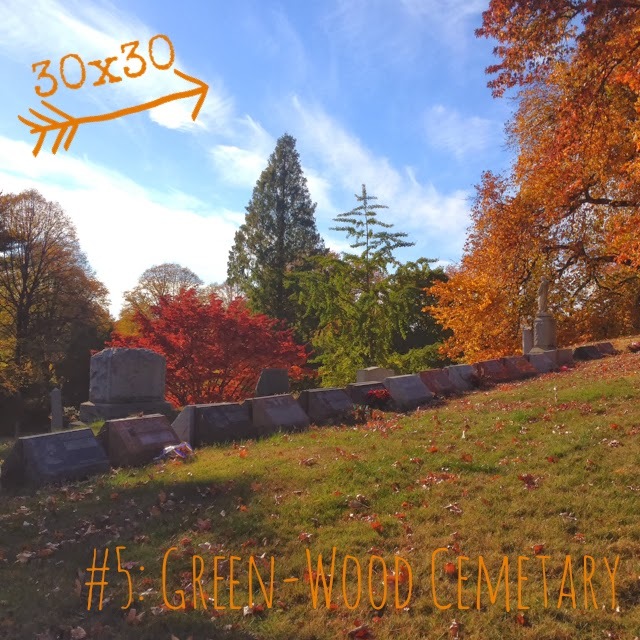 If you go: Green-wood Cemetery in Brooklyn is open seven days a week; take the D/N/R to 36th St. and walk to the main entrance located at 5th and 25th Streets.